A month ago, a very special friend finally set foot in Texas for the very first time. Denise & I have been gal pals since childhood, & since that story is a huge part of the reason VerverWerks exists today, I figure the story of our Texan adventure is worth telling. Denise’s hometown in the Netherlands is also my dad’s hometown, & we grew up spending blissful summers there together from age 8 into our teens ~ she, her family & her peers played a huge role in helping me to discover my Dutch side. That being said, it was only fair that we do Texas in style during her two weeks here. By the end of her stay, I had a queso-lovin’, scooter-ridin’ wannabe Austinite on my hands & I had to give her the boot to make her leave! Just kidding, I cried. Denise on her first day in Austin ~ headed to the shops on SoCo! On Denise’s first day in Austin, the weather wasn’t cooperating so we checked off a major bucket-list item with a 3-hour visit to Target. It’s always so fun to see internationals react to our American super stores; their massive scale & the choice available is often mind-boggling to newbies & Denise was certainly in heaven. Once the sun came out, of course, we had to start making our way to the Austin hot-spots. We explored South Congress on foot, enjoying the day & the atmosphere that’s ever-present in that part of town. I was sure to introduce Denise to Parts & Labour ~ an eclectic, fun Austin boutique filled with unique designs & souvenirs by local makers (that’s also now home to the VerverWerks collection). We then hit Güero’s Taco Bar for lunch; Güeros is especially fun during patio weather for the live music performances they host at the venue. Since you can’t properly delve into the Tex-Mex cuisine without trying queso, I ordered us some…. and the queso obsession began! Over the course of two weeks, we had queso at WAYYY too many restaurants; I think my favorite was at Torchy’s Tacos. Enjoying the queso & Margaritas at Güero’s off South Congress after exploring the city. We strolled by Lady Bird Lake & into downtown after spending some time on South Congress. The next afternoon we road-tripped to Dallas (while jamming to the Dutch rap of our teens) for The Boho Market. On the way, we made a pit-stop for lemonade at the famous Magnolia Market at the Silos in Waco. It was my first time at the Silos as well, & both Denise & I loved the vibe from the moment we arrived. Even on a Friday, the place was buzzing with tourists & families enjoying the relaxing setting. There’s literally something for everyone at the Silos ~ you can people watch or play games on the well-kept lawn, grab a bite to eat, or browse the farmhouse-style boutique. I wish we could have stayed longer. Denise & I at the Silos in Waco, Texas. Those that follow VerverWerks know I love The Boho Market (a market we participate in at least monthly). I was so excited for Denise to have a chance to see the business at the market & to show her the full Boho experience. Once a month, Taylor (Boho’s owner) literally turns Dallas Farmer’s Market topsy-turvy (in the best way) with her curated collection of socially-conscious, do-good Boho vendors, resulting in a market that provides a beautiful assortment of “local goods for local folks.” I know Denise enjoyed the fresh foods available at the market, especially WuDujour Asian Kitchen, & browsing the unique offerings of our Boho friends like Covert Metals. The March 9 Boho Market at The Dallas Farmer’s Market. Our next road trip after Dallas took us South, first to New Braunfels to see The Local, a quaint boutique with an artistic flair that made my heart skip a beat when I first stepped inside. Denise was a big fan as well; and how could you not be when colorful paintings immediately grab your attention & finely-made handcrafted jewelry draws you further in? Lot 59, sister store to The Local (where you can now find VerverWerks’ earrings), in New Braunfels, Texas. Per NB’er recommendation, we ate a great lunch at Huisache Grill, after which we mosied through the small town center (complete with historical train station) & stopped in at several more shops. Denise was smitten with New Braunfels for its charm & kept referring to it as similar to an “open-air museum” you might see in Holland. Most interesting to me is the city’s German history & how that’s still evident in the town’s culture. In the end, New Braunfels became a true trip highlight. Lunch at New Braunfels favorite, Huisache Grill. Another picturesque boutique in the heart of New Braunfels. From New Braunfels it was time to head further South to good ol’ San Antonio. Our first stop was Pearl Farmers Market, which is, simply-put, idyllic. The market area is huge & industrial, but well thought-out & the kind of attraction that made me really proud to show off Texas. Once again, this is a venue that offers it all: a brewery, family fun, shopping, etc. The Pearl Farmers Market complex, complete with brewery. Finally, Denise & I were off to the Alamo (Mission… famous for the historic Battle of the Alamo during the Texas Revolution). I loved being back at the Alamo as an adult, especially being now equipped with a better understanding of its historical significance for the state of Texas. The tour is free & you can’t go to San Antonio without doing it! The historic Alamo in San Antonio. We ended our San Antonio outing properly with Margaritas & Tex-Mex desserts (vanilla ice cream, cinnamon & crispy tortillas!) on the Riverwalk. Also highly recommended are the Riverwalk boat cruises that take you through downtown San Antonio & provide a bit of a history lesson (not unlike the rondvaartboot tours of Amsterdam) on the city. We ended the day in Austin & caught a show by Dutch musician Judy Blank at New Dutch Wave as part of SXSW. Margaritas & dessert on the San Antonio Riverwalk! After a lot of activity, Denise & I were both ready for a day of R&R. We first spent a morning browsing Whole Foods’ Austin headquarters & taking in all the amazing specialty & health products on offer. Then, we decided that the Greenbelt, a series of interconnected hiking trails that converge on popular Austin watering holes, would provide the perfect opportunity for relaxation. After all, Austin is known for its nature! The special SXSW cupcake selection at Whole Foods. Our next Austin day was mostly a South By Music day. We familiarized ourselves with the electric bikes (& scooters) you can now find all over town & had a blast using them. We started off on South Congress at South By San Jose, a free SXSW concert series hosted by Hotel San Jose. After scoring our not-to-be-forgotten photos at the “i love you so much” wall at Jo’s coffee shop, we then biked downtown & enjoyed a quick tour of The Capitol, which is taller than the U.S. Capitol because this is Texas after all! Later, we caught a show (which we both loved) by Scottish band Saint PHNX at Banger’s on Rainey Street. The highlight of our SXSW, however, was definitely Cinderblock’s annual South By party! Cinderblock’s party is hosted at an amazing ranch on the outskirts of Austin, & features a very-talented line up of musicians as well as Boho vendors. South By San Jose hosted by Hotel San Jose for SXSW. The Cellars at The Salt Lick in Driftwood, Texas. The Salt Lick is truly a memorable Texas experience for out-of-town visitors. Another day of adventure brought us briefly to Gruene to see the famed Gruene Hall, Texas’ oldest dance hall. The hall is still in operation ~ check their calendar to catch some live country music! Gruene itself is another charming Texas town with an interesting (& industrious) German history that offers the perfect weekend escape. After visiting, I learned The Travel Channel recently named Gruene one of the “most charming small towns in America” & that the town had been abandoned for years until it was rediscovered by chance in the 1970s. Of course, this was another gem that Denise really enjoyed. The historic Gruene Dance Hall! As a University of Texas alum, I was very eager to show Denise the UT campus (located in the center of Austin). Because universities in other parts of the world often have classrooms located throughout a particular city, experiencing the American campus & culture is a must for a lot of foreigners. We spent an afternoon strolling through the “Forty Acres” while I recounted some of my best college stories. That afternoon, we also checked off a few more of Denise’s Texas bucket list items, like getting a “Texan” hat! Exploring the campus at The University of Texas. “The Tower” on UT’s campus. Trying on hats at out friend’s, The Guayabera Shirt Store. Don’t miss Mozart’s for coffee on the lake! 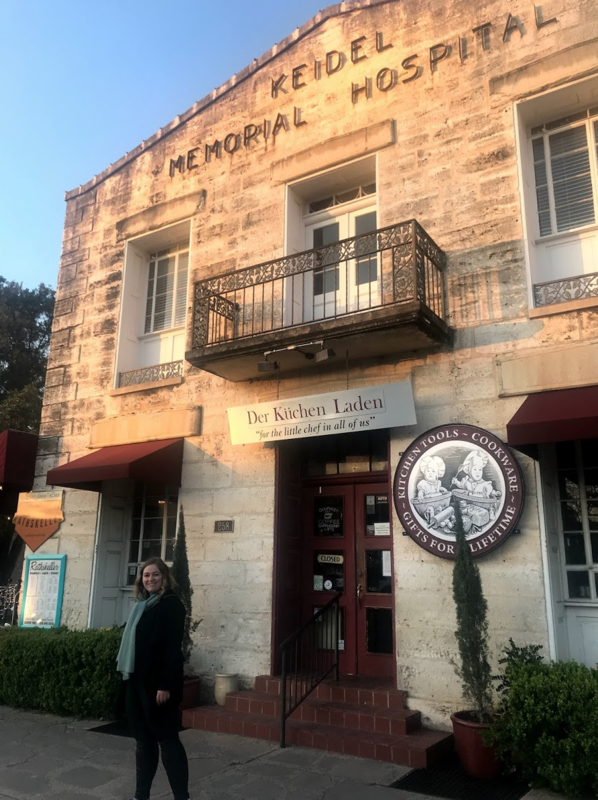 Our final mini road trip brought us, of course, to Texas wine country in Fredericksburg (surprise, surprise… another Texas town with German roots). 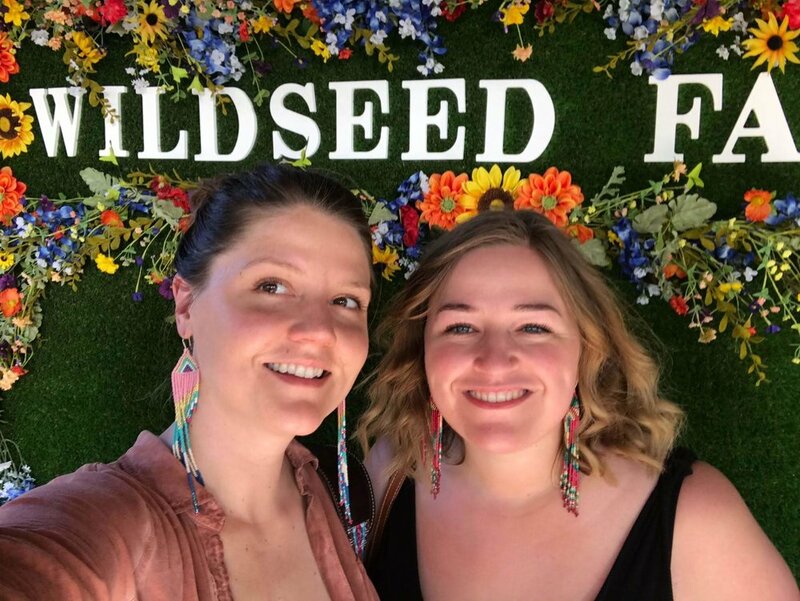 On our way out to the wineries, we passed the impressive, colorful grounds of Wildseed Farms & had to stop! We were pleasantly surprised to find out that, in addition to selling plants & seeds, the farm has a winery & we enjoyed a glass on the terrace after tasting a few wines. We then headed to Grape Creek Vineyards, where we really enjoyed the vineyard views. For anyone wanting to tour several wineries, weekend shuttles exist that will take you from winery to winery. Prost! An afternoon outing at Wildseed Farms on the outskirts of Fredericksburg. Home of the Rathskeller restaurant in Fredericksburg. On our way back to Austin from Fredericksburg, we passed through Bandera, the “Cowboy Capital of the World.” While we didn’t have time to stay long, Bandera boasts a ton of dude ranches that are so much fun for an authentic Texas experience or a weekend getaway. As a UT student, I took a group of exchange students to the Twin Elm Guest Ranch for a weekend & we had a blast ~ the experience included everything from horseback riding, to tubing (it’s a Texas thing, y’all), to ridiculous ranch games that had the whole group laughing. Needless to say, Denise & I had two VERY full weeks of fun exploring the best of what Texas has to offer! For us, this blog is a bittersweet ode to a once-in-a-lifetime trip & a friendship that spans the globe! For the reader, I hope you’ll find it useful for planning a little Texas getaway or for making Texas recommendations to friends! Below are links to all the Texas businesses & attractions recommended in this blog post. Take a close look to see why each adds some extra flavor to make our state so great!